The Strangest ... The Most Startling Human Story Ever Screened ... Are You Afraid To Believe What Your Eyes See? Tod Browning (1931's Dracula) directs this landmark movie in which the true freaks are not the story's sideshow performers, but "normals" who mock and abuse them. Browning, a former circus contortionist, cast real-life sideshow professionals. A living torso who nimbly lights his own cigarette despite having no arms or legs, microcepalics (whom the film calls "pinheads") - they and others play the big-top troupers who inflict a terrible revenge on a trapeze artist who treats them as subhumans. In 1994, Freaks was selected for the National Film Registry's archive of cinematic treasures. One of the most controversial films ever made, I suspect many more people have heard of Tod Browning’s 1932 horror flick Freaks than have seen it. David Bowie even mentions it in the song “Diamond Dogs”: “Dressed like a priest you was/Tod Browning’s freak you was”. With a reputation like that, how could I resist giving it a look? Freaks starts at a sideshow that introduces the subject of deformed humans on display. The guide shows his crowd an especially difficult to look at “freak”, though the camera doesn’t reveal her. Instead, the movie immediately flashes back to a circus setting, where we meet a mix of characters. The story introduces many “freaks” as well as non-deformed humans, but only a few of them really matter to the tale. Among those without prominent physical flaws, we find two good folks - Phroso the Clown (Wallace Ford) and Venus (Leila Hyams) - and two nasty people - strongman Hercules (Henry Victor) and trapeze artist Cleopatra (Olga Baclanova). Little person Hans (Harry Earles) is betrothed to similarly diminutive Frieda (Daisy Earles), but he clearly pines for the lovely Cleo. She recognizes this and teases him to her own end. Cleo pretends to care about Hans because he gives her nice gifts, and when she finds out that he inherited a fortune, she decides to pursue him more aggressively. Cleo intends to marry Harry then poison him, take his money, and hook up with Hercules. In addition to that story, some minor subplots emerge. We see the burgeoning romance between Phroso and Venus, and we also inspect the dual love affairs maintained by conjoined twins Violet and Daisy (Violet and Daisy Hilton). However, the film mostly highlights either the various forms of deformities or the Harry/Cleo thread and its ramifications. Frankly, that’s not much of a story, and Freaks suffers for it. Apparently critics at the time saw it as little more than an exploitative shocker, and at times it becomes difficult to defend it as anything other than that. Make no mistake - though we may be more “enlightened” now than we were 70 years ago, the sight of the deformed people remains startling and somewhat upsetting. I wish I could say that I didn’t feel disturbed at their conditions, but that wouldn’t be true. It was an intriguing move to cast true “freaks” in the roles instead of made-up normal folks ala Lon Chaney, but it definitely opened Browning up to charges of exploitation that remain hard to dispel. Granted, he does present them as fairly good people with a strong bond and code of honor. I won’t reveal what happens when they discover Cleo’s treachery, but it ain’t pretty. The film doesn’t simplify matters to the point where “freak” equals good person and “normal” human equals bad - Cleo and Hercules are really the only sinister folks in the tale - but Browning does allow us to see the sideshow characters as fairly real. Still, it’s hard to get past the concept of exploitation, partially due to the weakness of the story. This isn’t something like The Best Years of Our Lives in which a soldier deformed by war plays a significant role; he was an important part in telling the tale of what battle can do physically and psychologically. Yeah, Freaks presents some elements like that, but instead it seems most concerned with gawking at the unusual characters. One side effect that comes with casting actual deformed people means that we find many amateurs in the film, and their acting lives up - or down - to that status. Granted, the professional performers in Freaks don’t present Oscar-worthy work themselves, as they usually come across as very broad and over-the-top. Some of that stems from the acting styles of the era, but not all - or even most - of it. Instead, they simply weren’t good. However, the professionals are definitely better than the amateurs. Already hampered with squeaky voices and German accents, it becomes almost impossible to understand what Harry and Daisy Earles say most of the time, and their stilted and awkward deliver of the lines doesn’t help. Those problems go down the line, as none of the sideshow characters feature good performances. Nonetheless, some interesting moments occur. I particularly like the simple and understated scene in Daisy gets kissed by a suitor and her conjoined twin feels it; Violet’s reaction is much more expressive than I would expect. The film’s climax also works quite well, as the enraged “freaks” do their duty. Unfortunately, that powerful sequence leads into the film’s most laughable. The movie cuts from the “freaks” revenge to the sideshow character discussed but not revealed at the flick’s start. We now get to see this person, and Browning expects us to feel horrified, I suppose. However, the reveal exposes such an absurd character that what should have been the movie’s more disturbing moment becomes its funniest. Issues like that abound in Freaks. An inconsistent film, it suffers from a thin plot, poor acting, and a shaky sense of morality. However, it does produce an intriguing and unusual view of circus life; this definitely isn’t your standard circus flick like The Greatest Show on Earth. It’s not an enjoyable movie, but it’s different and interesting enough to merit a look. 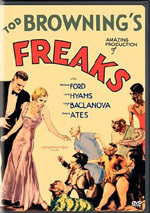 Freaks appears in an aspect ratio of 1.33:1 on this single-sided, double-layered DVD; due to those dimensions, the image has not been enhanced for 16X9 televisions. An erratic piece, the picture varied from pretty good to moderately problematic. Sharpness seemed inconsistent. Most of the time the image remained acceptably crisp and distinct, but it could also turn somewhat soft. Still, it mainly came across as fairly detailed. Jagged edges and moiré effects caused no issues, and I also noticed only slight signs of edge enhancement. However, print flaws created more substantial concerns. Much of the film seemed fairly grainy, and other problems occurred. Specks, grit, marks, blotches, nicks, streaks and tears popped up at times. Significant portions of the film passed with only minor defects, but they became much more noticeable at times. Parts of Freaks seemed too dark, and the image came across as somewhat dim at times. For the most part, black levels remained acceptably deep despite the erratic contrast; they looked a bit grayish at times but usually stayed decent. Shadow detail was a bit flat but generally worked fine, as the movie’s many low-light shots fared fairly well. The concluding shots at Hans’ mansion looked terrible, though, as they were excessively bright; it appeared likely they came from a different source than the rest of the movie. Despite that issue, given its age, the transfer of Freaks looked more than acceptable, but it didn’t match up with the best-looking DVDs from the era. The monaural audio of Freaks also came across as erratic and acceptable at best. Speech created some of the biggest problems. The lines always sounded thin and shrill, and they displayed definite issues with intelligibility at times. Some of this resulted from the performers’ speech; for example, Hans and Frieda have high voices, and their heavy accents exacerbate things. Throughout the film, I found it tough to comprehend what many folks said. Music played almost no role in the flick. As with most flicks of the era, it included little score, so mainly we heard music from practical sources like the performers at the wedding feast. Effects sounded tinny and indistinct but were acceptable for their era. They presented no life or heft, but except for the thunder in the climax, they lacked distortion and were fine given their age. As for source flaws, some background noise showed up throughout the movie, but it didn’t seem heavy, and not much popping or hiss appeared. Ultimately, the track didn’t seem bad for something from 1932, but the speech problems made it a little below average. A mix of extras round out the Freaks DVD. We start with an audio commentary from Tod Browning biographer David J. Skal. He presents a running, screen-specific discussion of the movie that proves reasonably informative. Much of the time, Skal goes over biographical details about Browning and the actors as well as material cut or changed in the final film and the varied reactions to it. We also hear a little about the different ways that the “freaks” themselves dealt with the film, as some apparently embraced it while others grew to hate it. The content itself seems positive, but unfortunately, more than a few instances of dead air mar the presentation. Given the richness of the controversial topic - and the brevity of the film - these become less excusable than usual. Nonetheless, I learned a fair amount about Freaks during this generally useful chat. The Special Message Prologue ran with some screenings of Freaks. It sets up a history of malformed people and gives the audience some information about what they’ll see. It’s an interesting historical footnote. At 63 minutes and 18 seconds, Freaks: The Sideshow Cinema offers a surprisingly long documentary connected to the film. It presents archival materials, movie snippets, and interviews with Skal, sideshow performers/historians Todd Robbins and Johnny Meah, sideshow performer Jennifer Miller, and actors Mark Povinelli and Jerry Maren. We learn about the origins of the film and Browning’s path to it, casting the regular humans, perspectives on fascination with different forms of people and the particulars of sideshows, details about the various “freaks”, production notes, reactions to the film and its legacy. ”Sideshow” progresses somewhat oddly when compared to most documentaries of this sort, but it proves very satisfying. The extended discussion of the lives of the “freaks” seems especially fascinating, but the whole thing works nicely. We get enough about the film’s creation to make those elements satisfactory, and the extra information about the personalities adds nice depth to this fine program. Finally, we get a featurette called Alternate Endings. In this five-minute and 55-second piece, we don’t get to see any cut material, unfortunately, but Skal provides a good accounting of the film’s various versions. He repeats some of this from the commentary, but he provides a concise elaboration of the specific bits here. One of the oddest and most notorious films ever made, I can’t call Freaks a good movie, but it’s undeniably an interesting one. Marred with poor acting and a thin story, it still is intriguing and unusual enough to make it watchable. The DVD presents fairly average picture and audio when compared to other flicks of the era, but a nice set of extras helps put the film in perspective and offers a lot of useful material. 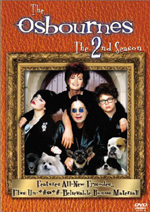 I didn’t much like Freaks, but its position as historically notorious means I have to recommend this DVD.